Researchers (from left) Dhara Amin, Dawn Elliott and John Costi. 9:46 a.m., Nov. 16, 2015--Dawn Elliott went halfway across the world to find a research collaborator, but it was well worth the trip. Elliott, professor and chair of biomedical engineering at the University of Delaware, uses mathematical models and mechanical testing to better understand the function and behavior of soft tissues such as intervertebral discs, which support and distribute loads and permit motions of the spine. 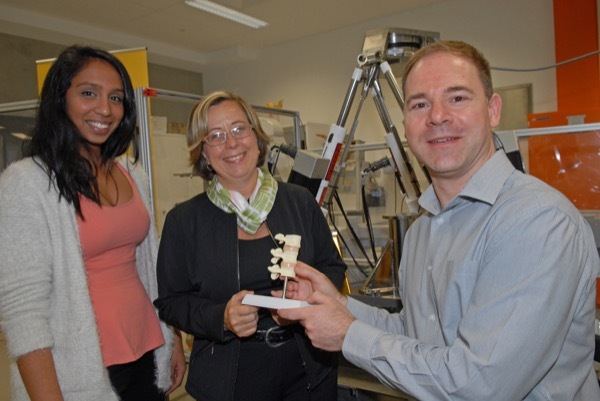 More than 10,000 miles away, in Adelaide, Australia, John Costi is also working to understand the mechanisms of spine disc degeneration and tissue injury in the Biomechanics and Implants Laboratory at Flinders University. Costi’s experimental capabilities are a perfect complement to Elliott’s predictive models, and the two have been collaborating since 2013. Elliott spent the summer of 2015 at the Medical Device Research Institute at Tonsley under a Flinders Visiting International Research Fellowship. There, she had access to a novel hexapod robot that can subject discs to realistic loading scenarios. “The robot’s accurate mechanical loading capabilities are combined with tissue testing, mathematical modeling, and multi-modal imaging to come up with next-generation knowledge about managing spinal health,” Costi says. Dhara Amin, who earned her bachelor’s degree in mechanical engineering at UD in 2013, received a grant from the Whitaker International Program to complete a one-year research project in biomedical engineering at Flinders, and she is now a master’s candidate there. Elliott hopes that Amin’s ties to both institutions can continue through a joint Ph.D. program currently in the planning stage. According to Kim Bothi, associate director for science and engineering at UD’s Institute for Global Studies, a “cotutelle” between Flinders and UD is being explored, with the first step being to develop a memorandum of understanding. Elliott believes that her successful partnership with Flinders will lead to breakthroughs in developing and testing therapies for the spine.